Pegasus pictures to print out and shade in. 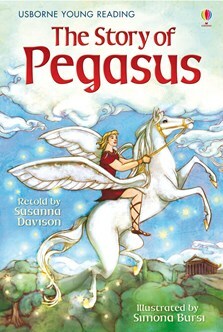 A lively re-telling of the Greek myth in which Pegasus, the flying horse, helps hero Bellerophon to defeat a fire-breathing monster. This short story is full of excitement, engaging children who are starting to read on their own. Part of the Usborne Reading Programme, comprising over 250 titles. Another carefully graded book from Usborne Books to help children get a head start in reading. Short chapters, plenty of colourful pictures, and language pitched at the right level mean that young readers can start on the exciting journey of reading with confidence and knowing they will have an enjoyable read.